Sad day Friday – we found the body of one of our sheep, lying in the stream. It looked like she might have tangled her foot in her fleece and lost her balance, and fell into the water and couldn’t get out; probably on Thursday, a day of heavy rain. This is our first large-animal death (well, other than being butchered for meat… which is different, somehow). So it goes. 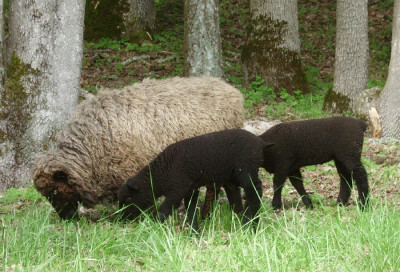 The unreasonable joy of lambs in the spring is balanced by cold dreary death in winter. This entry was posted in Farm updates and tagged sheep.